November | 2013 | and a beauty to you! Last night I remembered something that I meant to say about Thanksgiving wines but totally forgot… I was having dinner with Andre Tamers, who imports wonderful wines – mostly from Spain (http://demaisonselections.com), and realized I had been remiss in leaving his wine out of my post. It is the perfect sort of red that I was describing yesterday. The wine comes from the northwest of Spain, a part of Spain they call the celtic or green Spain because it looks more like Ireland than the sunny south of Spain.It is the region that produces the stunningly delicious Albarino and if you’re lucky enough to get a bottle from Andre’s producer, Do Ferreiro, you’ll really see how good Albarino can be. But the red that I am talking about that would be great on Thanksgiving is Vina do Burato; a light, complex and elegant wine made from a grape called Mencia (Men-ThEE-a). It’s weeks like this that I really miss being in the wine business. I always enjoyed helping people pick out the wine to have with Thanksgiving dinner. So even though I don’t have a wine store, I am going to say my piece about Thanksgiving and wine. First of all, even though I think of white wine as the better choice for the meal, there is no consensus to uphold that. And the white wine I feel is best might cause you to get the stink-eye from your guests. My white wine of choice would be a German or Austrian estate Riesling, and even though we used to sell them as dry, they do have a hint of sweetness. I’ve never seen anything like it – but most Americans run from a wine with any hint of sweetness, so I suggest you go double-fisted at Thanksgiving with a red and a white. If you have a bottle of european Rose left over from the summer-time that would go great with the meal as well, and bubbles are always recommended. Maybe, since its so late with Thanksgiving just a few days away, I should tell you what I think would NOT be a good choice. A rich, buttery high-alcohol “new world” Chardonnay would be at the bottom of my list for wines I would like to be served at Thanksgiving. And tied for last would be a new-world high alcohol red that tastes like raspberry juice – I’m talking about you 15% Zinfandel and Argentinian Malbec – or overpriced new world Pinot Noir with 15% alc. and a hefty price tag. So what red would I recommend? I know this is going to cause some head-scratching, but my top choice would be a Pinot Noir from Germany, a Pinot Nero from northern Italy, or a Zweigelt from Austria. I love Zweigelts from Austria, they are light and versatile, and their spiciness goes perfectly with a Thanksgiving meal – I believe. 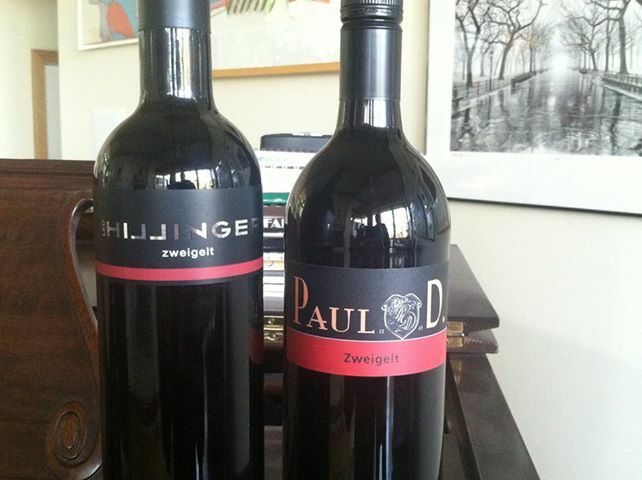 The Paul D. Liter bottle ($11.99) I bought today from my friend Kate Aleia at Wine Authority is only 12.5% alcohol – EXCELLENT! The bottles with the caps that look like an old beer bottle closure are my favorites (from companies like Berger, just to name one I remember) – but I haven’t seen any bottles like these in any of the wine stores I’ve been in in the past few months. I also bought a more expensive Hillinger 750mL ($19.99) bottle that I remember from 3Cups as an estate that made Zweigelt and was a staff favorite. The Hillinger Zweigelt rings in at 13% alc. – NICE! The colder weather is occurring with some regularity and I have been enjoying slow cooking pots of beans. Let me be more specific… not coffee beans but dried legumes. A pot of properly prepared beans has a pot liker (or gravy) that together with the buttery bite of the bean itself, is very satisfying and unctuous. This is archetypal peasant food and really comforting to me. Seasonal food that just will not do when it’s 70 degrees outside. Foods like beans, stews and other hearty dishes make me enjoy the wintertime. If you have ever cooked dried beans that didn’t satisfy you, because of a crumbly, too dry texture, you are not alone. The reason why beans taste this way and have this unpleasant texture is because they are too old. Dried beans have a shelf life too. I was recently at an excellent local restaurant and was served a cup of white bean and kale soup. The broth was excellent. As was the kale. But the white beans had that crumbly and unstatisfying texture. I’m sure the kitchen had boiled them plenty, but the fact could not be ignored, they were past-crop beans. I was once again faced with a pervasive challenge in our culture: Americans don’t care much about beans, that’s why they sell them in cans. And therefore the loose beans that are sold in bags or in bulk bins, that hardly anybody buys, are, in my experience, always so old that you can’t cook them back to their tender, buttery bite. Beans have long been seen as poor folks food, but this in no way means that their best iteration is not enjoyed by farmers the world over (see recent post: Farmer’s Table Food and Wine). For most people, though, beans are relegated to the tin can. Think about the foods we package in glass jars versus the one’s in tin cans and you’ll get a quick idea of a food’s value in our culture. Here’s the problem with beans in a can, they are cooked in the can and so you’re instructed to rinse the slurry off before using. Why? Because the pot tastes like a tin can. In Europe dried beans are sold as new crop in the fall and winter. The inventory leftover from the previous crop is sold off as a lesser commodity. Beans grow in the summer and become dried in the fall and are ready for the winter. But if there are still beans left from last summer, and nobody is paying attention, then you end up with old beans which often can not be cooked back into good food. That’s why I am writing to you. As a southerner, I have a freezer full of butter beans, lady peas and varieties of Crowder peas purchased at the Carrboro Farmers’ Market. But I also like black beans, white beans, and brown beans and you cannot buy these locally grown. 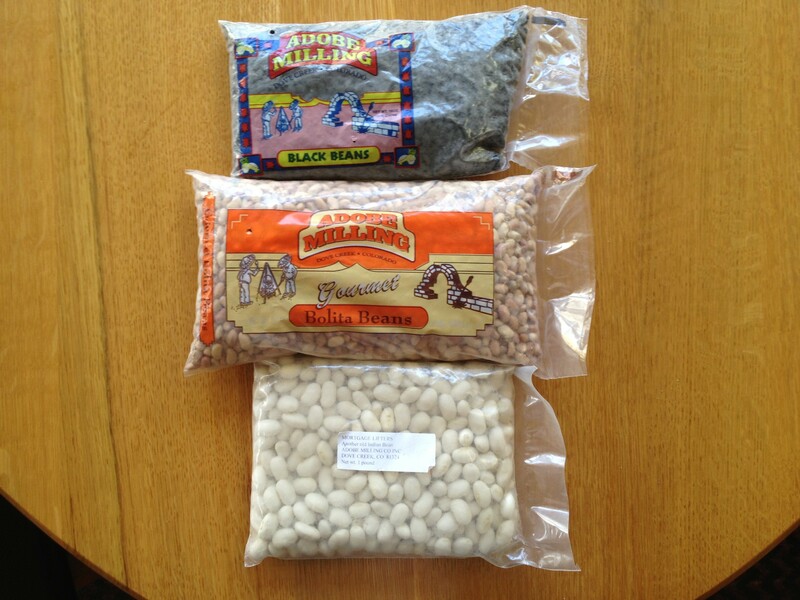 So I recently ordered some new crop dried beans from Adobe Milling, a group of farmers in Colorado. They grow the beans at a high altitude and dry farm (meaning: without the use of irrigation), which means, if beans are anything like wine grapes, flavor is maximized. I particularly like the Bolita beans, which are similar to pintos but lighter in color and slightly sweeter in flavor. The beans are so inexpensive from Adobe Milling, the freight to get them here cost almost more than the beans, so it’s a good idea to go in on an order with a group of friends. And remember, it’s not your bad cooking. It’s the old beans. Give it another try. I’ve noticed that this is a common theme that I hear in these farming communities that make value-added products from what they grow. The farmers don’t want their products to be perceived as elitist and only accessible to the rich, so they’re often priced below their value. Another example would be the fruit butters that come from the Bauman Family in Lancaster County, Pennsylvania. I did a tasting of their apple and plum butter at Market Street Coffee in Chapel Hill, and everyone that tasted bought. So most of the inventory is gone at Market Street. (Although there may be some Pear Butter left, which is also quite amazing.) There is something like 10 pounds of apples in one pound of apple butter. But it still retails for just a few dollars! I hope to organize a small tasting this fall at Market Street Coffee, to showcase of a few of these Farmer’s Table Wines.